We’d love your help. 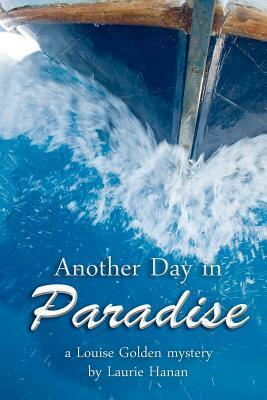 Let us know what’s wrong with this preview of Another Day in Paradise by Laurie Hanan. I loved that Emmeline & Jackie were still in the se This is book 3 in the Louise Golden mystery series by Laurie Hanan, and I would have a tough time deciding which book I like more, all three are really good. They all kept my attention, had a wide range of great characters, unusual scenarios, and they all kept me guessing. Plus, you get a peek into life in Hawaii! Even with it’s tropical awesomeness, there are still bad things that happen, and bad people, just like every where on the planet. The third of the Louise Golden, Oahu mail carrier series has more twists and turns than the road to Hana, Maui. But if you really wnat to know what goes on in our Hawaii Paradise..... you'll just have to read it! Otherwise, we are keeping it a secret. This is a book with great bones, but too much meat hanging off them (sorry, since many of the characters are vegetarians that might be a bad comparison). I can tell that the author put a lot of herself into the book and into the characters, particularly the main one. That's admirable but in this instance I think it gets in the way. There's a lot of description, particularly of meditation and its surrounding practices that doesn't further and wasn't necessary to the storyline. It's also a book tha This is a book with great bones, but too much meat hanging off them (sorry, since many of the characters are vegetarians that might be a bad comparison). I can tell that the author put a lot of herself into the book and into the characters, particularly the main one. That's admirable but in this instance I think it gets in the way. There's a lot of description, particularly of meditation and its surrounding practices that doesn't further and wasn't necessary to the storyline. It's also a book that suffers from one of my pet peeves, which is tense switching. Most of it is in past tense, but there are so many instances (particularly early on) where an action will be described in past tense, then one immediately following in present. As a former editor that really pulled me out of the story and almost made me put the book away. To be fair, this resolves itself about halfway through the book. I'm not a huge reader of mysteries, although I've done my time with Jane Marple, Hercule Poirot, and Sherlock Holmes. It seemed to me that there were just a few too many red herrings. Maybe if I'd read the first few books in the series they would have been less noticeable? There are a few clues planted throughout as to the identity of the killer, done quite subtly, but the reveal at the end had me cringing -- not over the killer's personality shift, but over the naivete of the protagonist. I would have thought that after all she'd been through, she'd have paid attention to her gut when it was screaming do not go anywhere with that person alone! Alas, she didn't listen to me either. The beach polo and horse care scenes were really well done. They had a very nice flow to them. A lot of the characters were reprehensible, though, which makes it difficult to develop an emotional connection with them. I wanted to be able to feel worse about the protagonist's personal life, especially at the end, but couldn't muster the sympathy. What did I know about Hawaii before reading this book? I used to watch the police detective show "Hawaii Five-O" as a teenager and I recently enjoyed a George Clooney movie that took place there (I remember the actor running frantically down a street). Other than that, I pictured Hawaii as sandy beaches, lava-filled volcanoes, island hopping boat rides, and girls dancing with garlands of flowers around their necks. In short, paradise. Reading this book I realized that there's a regular sort of li What did I know about Hawaii before reading this book? I used to watch the police detective show "Hawaii Five-O" as a teenager and I recently enjoyed a George Clooney movie that took place there (I remember the actor running frantically down a street). Other than that, I pictured Hawaii as sandy beaches, lava-filled volcanoes, island hopping boat rides, and girls dancing with garlands of flowers around their necks. In short, paradise. Reading this book I realized that there's a regular sort of life in paradise. People have jobs, walk dogs, go to the beach, and order take-out pizza. Some of the people also have very comfortable lives, as they own horses, play polo, and drive fancy convertibles. Whatever their lifestyles may be, paradise is home for them. Sometimes, bad things happen in paradise. Pets get stolen, car tires get slashed, and people get murdered. Sometimes it turns out that the most ordinary things are not that ordinary. For a light mystery, this is good value. Fun but with just enough weight to keep it from blowing away with the tropical breezes in this novel set in Hawaii. Louise Golden is a mail carrier who seems to keep stumbling on special deliveries of the unwanted kind. I read it over the holidays when I was too stressed to concentrate on anything heavy. It was just the ticket. A great mystery! The plot was placed perfectly to keep me guessing. I definitely did not see the ending sneaking up on me. Louise is charming and admirable and I look forward to reading more of her stories!